I’m pretty sure you could live out the remainder of your days without ever learning the rest of the story about our backyard. But you know what? I’m going to show you anyway. This shows Pete’s tree, the pine in the back. And the mud, oh the mud! Even in the season of grass (as opposed to mud) the old shared dog run creates an unsightly view from the room where we spend the majority of our waking hours. 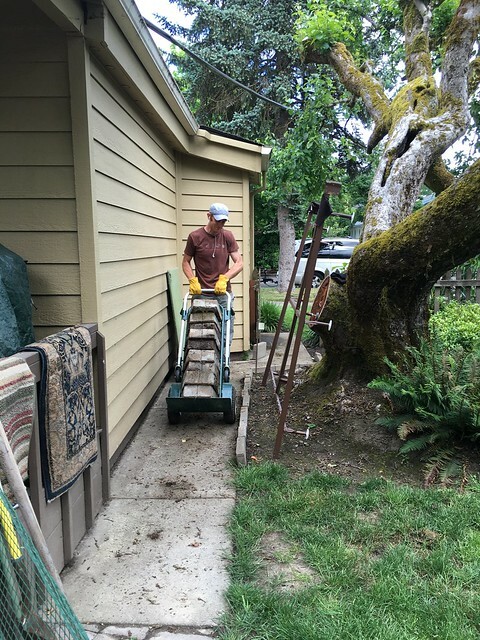 When John carried away our “coliseum” pavers to repurpose at his house, he had to maneuver this narrow pathway. As bad as this looks, it represents great progress. 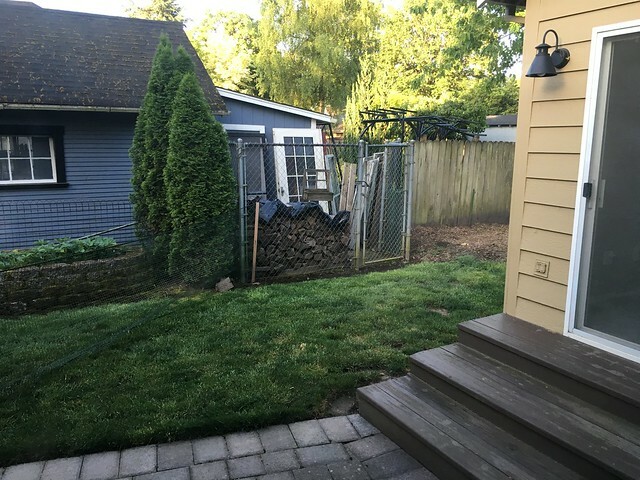 Pete’s tree is gone, the stump ground to smithereens, the dog run concrete removed, the trash removed, the ground leveled, and—to our back-door neighbors’ delight—the accurate property line defined. 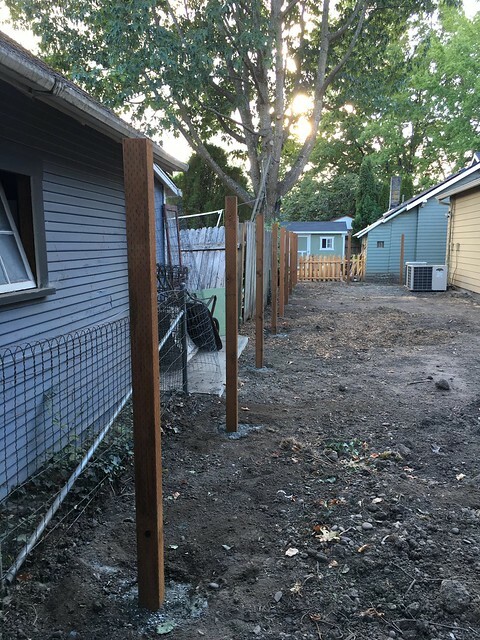 Our new fence posts show the true division of our yards, giving breathing room next to the neighbors’ garage. 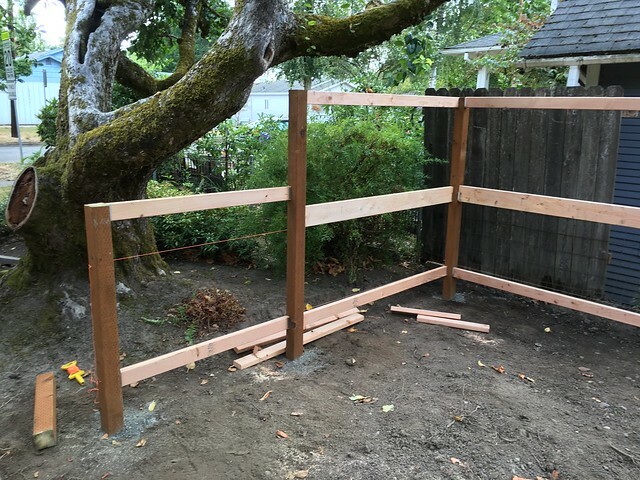 Eighteen inches might not seem like a big deal to country dwellers, but we city dwellers know how to appreciate elbow room. 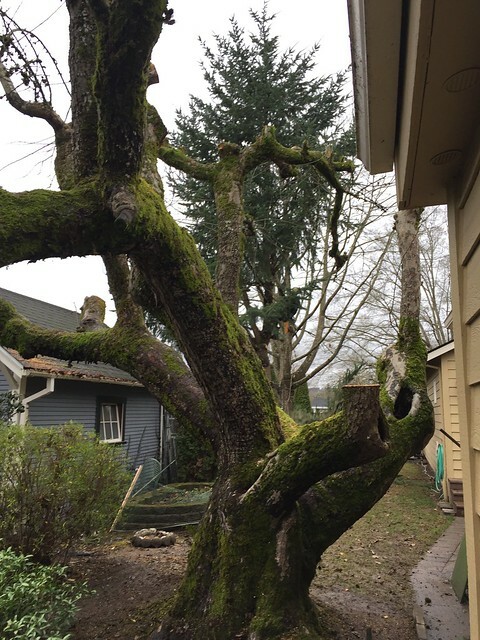 That gnarly apple tree holds many Macy family memories, but our yard guy advised Mauri it might be time to start releasing attachments. I stepped outside this morning to snap a few pictures before the sun started casting shadows. 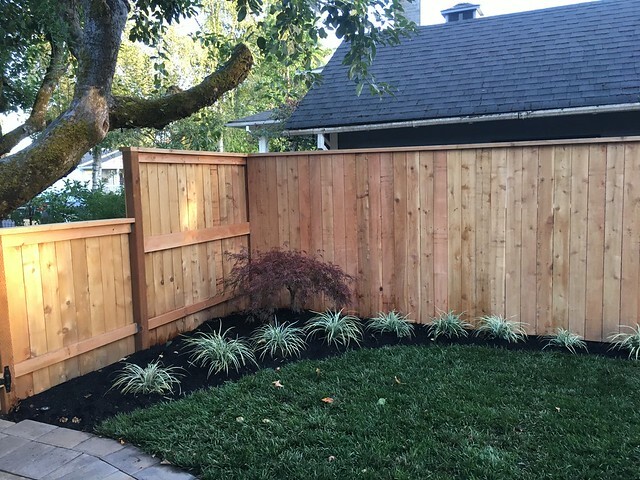 No fancy landscaping for us, just a row of liriope along the fence and a new Japanese maple in the corner. We chose a heartier grass than last time (only 6 years ago!). Fescue. 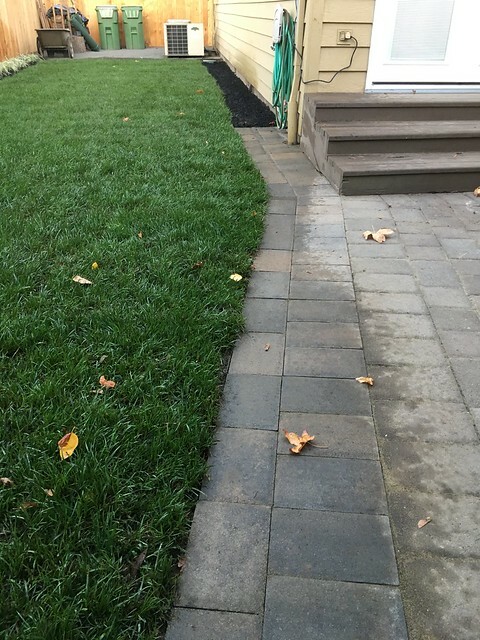 Sod for the backyard, seed for the front. We hope better sun exposure and our new watering system will give it longevity. 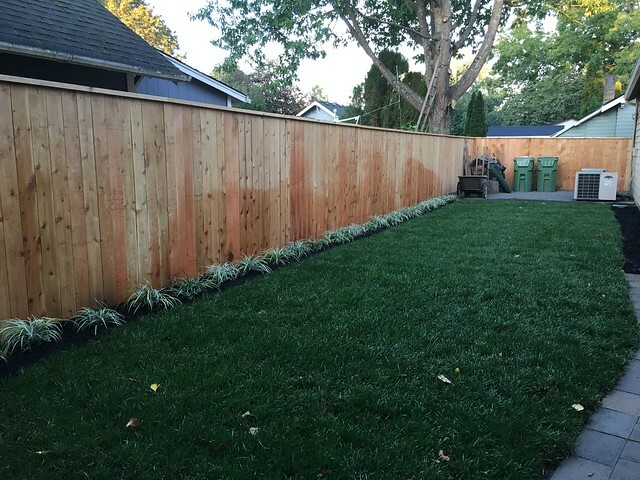 Our freshly watered fence might grow too! 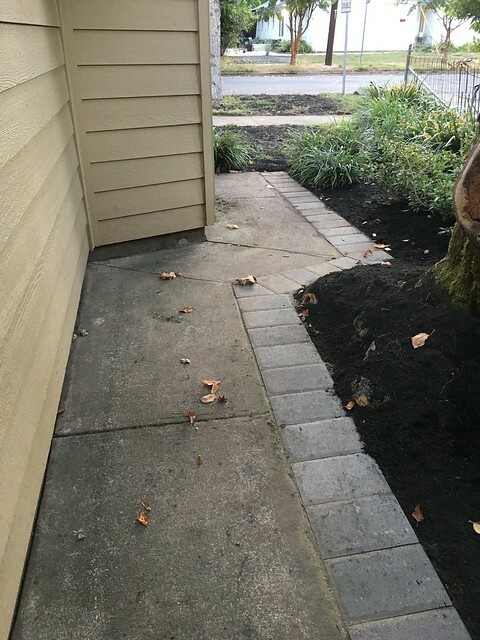 A row of pavers widens the path, this way . . .
. . . and this way. 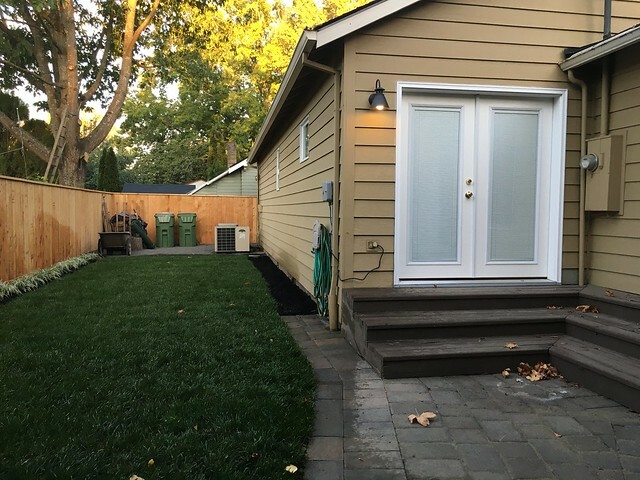 A panorama of the whole backyard redo! Don’t let the skewed perspective throw you off. It doesn’t actually curve. Mauri is especially glad this project is finally complete. He spent the whole summer navigating delays with the side and back neighbors while we waited our turn. 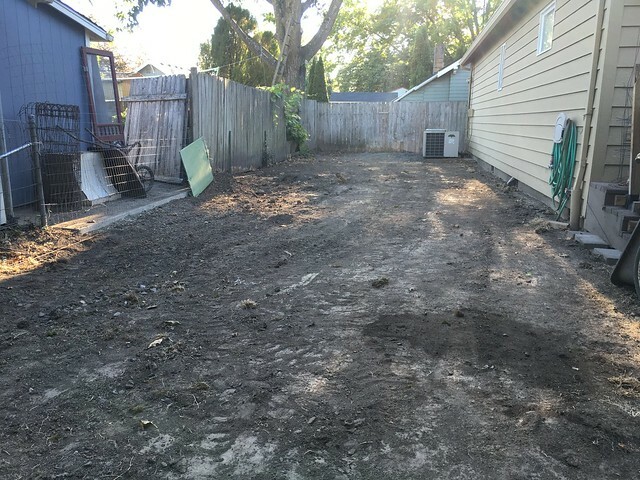 Backyard update accomplished, we can move on now.